Hello my faithful cooking friends! Wanna talk garlic? Wanna cook with garlic? Wanna, wanna, wanna? The midwestern in me has taken over the easterner in me, thus, the "wanna". My apologies. In my house its a garlic battle, constantly. My husband USED to like garlic, suddenly in the last 3 months he has decided he does not enjoy it. I thought perhaps he just didn't like biting down on a piece of garlic in any particular dish so I started rubbing the pan I was cooking in, with a piece of cut garlic. Hint of flavor and no pieces to chew on. Even that has him all in a mess. I tried elephant garlic which really is hardly garlic at all. Its a member of the leek family. It tastes of mild onion with a faint taste of garlic. I enjoy it. In fact I love it. But it's a member of the ONION family...should have been my sign my dear husband wouldn't like it. I on the other hand, eat garlic raw. There is nothing better than memories of my mom's homemade dill pickles, because I could fish the garlic out and eat it. Slowly roasted garlic cloves spread on crusty bread. YUM! My mouth is watering, for the record, I think its a possible psychiatric disorder. Same thing happens when I dream of pickles! The point being, there is likely no garlic I don't love. I recently tried some garlic with a little zip, called Rocambole Garlic. It was awesome! Without further adieu, let us get to the recipe at hand. 4-6 pieces of chicken. Bone in or out. 40 cloves of peeled garlic. Preheat oven to 300 degrees. In a shallow, oven safe pan on LOW heat, melt 2 tbsp of butter and 1/4 cup olive oil. 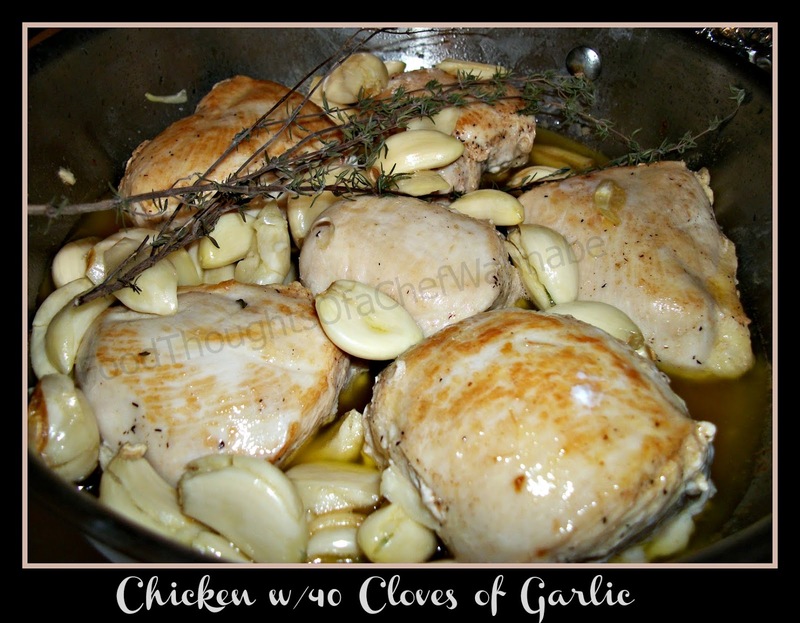 Toss in all 40 cloves of garlic and toss around. Allow to heat in the pan as long as it takes to prep chicken. DO NOT BURN. Low heat is fine, you do not want it to brown, just cook. Using paper towels dry chicken pieces. Sprinkle liberally with salt, pepper and dried seasoning of choice. Remove garlic from pan, put on a cookie sheet and put into oven to roast while you cook your chicken. Put chicken in pan and brown, approx 3-4 minutes on each side. When you turn them over on the second side, put your garlic from the oven back in the pan, all over the top of the chicken. Add remaining 2 tbsp of butter, chicken stock and sprig of thyme, put a lid on and put in preheated oven for 1 hour. Remove chicken from oven, and put skillet on medium heat and reduce stock for a nice pan sauce..
Garlic should be whole but very soft. Serve with crusty bread and use garlic to spread on it. This recipe is not for the faint of heart when it comes to garlic. It is an intense garlic flavor, your house will smell better than Christmas!!!! OK , just my opinion. Make sure when you buy your garlic you look for, tight skin, tight cloves that aren't loose. No shriveled up garlic or crumbling garlic. If the garlic has sprouted....its my opinion you should not use it. Garlic should feel heavy, and not be wet! I think it would be nice to use a variety of garlic in the dish, some a little hot and some a little milder. So get up, and run to the store. Add garlic to your shopping list! Get some extra...you DO realize Halloween is coming and the vampires will be out in full force!!! Note from chefwannabe's husband, "This chicken is truly not for anyone who doesn't LOVE garlic. I do not LOVE garlic. I like it...well I used to like it." Ok, I am cutting him off there. He obviously considers this a MISS in our kitchen. I begged him to lie to me when he took his first bite, but alas, a truth teller he is, even when he shouldn't be! Notice how tiny I made this writing? Pffftttt! and if you haven't had it yet, try finding pickled garlic, just whole garlic cloves in pickling liquid, great on it's own but sliced and added to salads or sandwiches are great too.. I have pickled garlic myself. I am never without pepperoncini for salads and sandwhiches but I just might have to give garlic a try, used in these applications. Thanks for reading and the suggestions! I too love garlic. However, I'm off garlic until my hernia calms down. However, I could spread a pan and just not eat any...love the article! Thanks again honey! I'll be trying this soon.